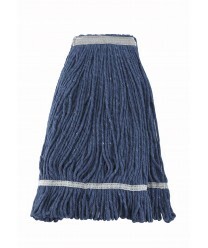 Winco MOP-32 Blue Yarn Looped End Wet Mop Head, 32 oz. Winco MOP-24C Blue Yarn Cut End Wet Mop Head, 24 oz. Winco MOPH-7M Metal Quick Change Mop Handle, 60"